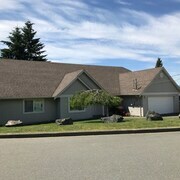 Where to find Campbell River hotels near an airport? 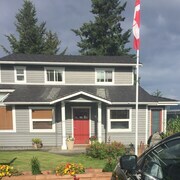 Where can I find hotels in Campbell River that are near tourist attractions? Campbell River boasts a good range of upscale and affordable places to sleep. Our extensive hotel database offers 19 accommodation options within 0.1 kilometres (0.1 miles) of Campbell River's heart. 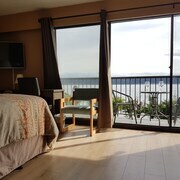 Some of the more central accommodation options of downtown Campbell River are the Coast Discovery Inn and Harbourside Inn. The Campbell River Travelodge and Anchor Inn And Suites are closest to Campbell River Visitor Centre, while the Heron's Landing Hotel and Best Western Austrian Chalet are within an easy stroll of the Campbell River Museum.â€¨ Those traveling to Campbell River for Torii Gate could book a stay at the nearby Whiskey Point Resort and Driftwood by the Sea Inn and RV Resort. Hotels near Discovery Passage Aquarium, include the Hidden Harbour Vacation Rental and B&B and Money Pennies B&B. 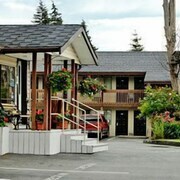 The Ocean Resort is located 17 kilometres (11 miles) from downtown Campbell River. Alternatively, the Heritage River Inn is located 2 kilometres (1 mile) away. Some other Expedia-registered hotels include the April Point Resort & Spa and the Painter's Lodge. Another place to spend the night is Comox, which is 45 kilometres (28 miles) to the southeast of the heart of Campbell River. Here, you'll find the Comox Municipal Marina and the Comox Ferry Terminal. Comox accommodation options include the Crown Isle Resort and Golf Community and Port Augusta Inn and Suites. April Point Seaplane Base Airport is a logical airport for Campbell River travelers, and can be found 4 kilometres (2 miles) away from Campbell River. Accommodation options nearby are Heriot Bay Inn and Comfort Inn & Suites. 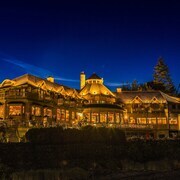 What are the most popular Campbell River hotels? Cozy Beach Cottage on the Water! Are there hotels in other cities near Campbell River? 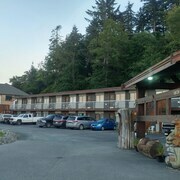 What other types of accommodations are available in Campbell River? Explore Campbell River with Expedia.ca’s Travel Guides to find the best flights, cars, holiday packages and more! Flights from Pudong Intl. to Suvarnabhumi Intl. Flights from Sky Harbor Intl. to McCarran Intl. Flights from Seattle Tacoma Intl. to John F. Kennedy Intl. Flights from San Diego Intl. to Vancouver Intl. Flights from Narita Intl. to Pearson Intl. Flights from LaGuardia to Vancouver Intl. Flights from McCarran Intl. to Sky Harbor Intl. Flights from Ataturk Intl. to Pearson Intl.